Remarkable to see Carl Icahn, the real-life model for Gordon Gekko, springing into action when only a few days ago his position according the Journal was this: “Mr. Icahn says he will closely monitor Mr. Zander’s performance and if the company is still struggling by the end of the year, the board should hold management accountable.” I guess that Journal story was a real wake-up call for Carl Icahn, who, as I’ve pointed out, couldn’t have had anything to do with setting up that story, since he wasn’t even mentioned until the very last paragraph. Funny, there’s also a story about Motorola in today’s Journal by one of the writers who did the Motorola story last Friday. And today’s story refers to the Carl Icahn advertisement that runs in today’s Journal. Wow, Carl Icahn is really getting some bang for his buck. It’s really cool to see how an institution like the Wall Street Journal, with its reputation for integrity and independence and objectivity, refuses to collude with rich, powerful, influential people like Carl Icahn who would gladly feed them information on all sorts of companies in exchange for favors. Journal, this is your finest hour. 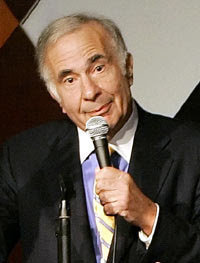 You’ve declined to do Carl Icahn’s dirty work. You’ve refused to help him manipulate stock prices. You’ve also taken the lead on this options backdating scandal, and you’re helping to bring dangerous criminals like me to justice and distracting me so I can’t make any new products. Bravo, Wall Street Journal. Hold your head up high, you paragons of virtue. Truly, you are making the world a better place.